I remember back when I first laid eyes on a Miyazaki film. It was in early 2003 just after Spirited Away won the Academy Award for Best Animated Picture. Disney had decided to re-release the movie into theaters for a couple of weeks before they released it onto DVD. So a couple of my high school buddies and I made the trip to some remote art house theater somewhere in Jersey to see what all the hubbub was about. What I saw was one of the most incredible films ever created. Miyazaki had managed to create such a wonderful world full of Japanese traditions, spectacular imagery, and childish wonderment. And in the film’s climax when the two leads are flying together in the air, I was bawling my eyes out over the beauty of it all. I was truly blown away from the film and have been desperately trying to find that same awesomeness with Miyazaki’s other works. I really enjoyed films like My Neighbor Totoro, Porco Rosso, and Princess Mononoke on DVD, but they still didn’t quite speak to me the way that Spirited Away did. And when I went to the US premiere of Howl’s Moving Castle back in 2005, I found that the film’s extremely cheesy ending ruined whatever momentum it had going for it. Well, I’m now beginning to think that Spirited Away might have been Miyazaki’s last great film. His newest one set for release in America this Friday, Ponyo, turns out to be his biggest disappointment yet. 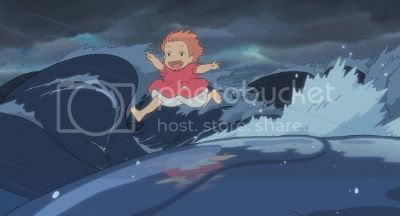 Ponyo tells the story of five-year-old Sosuke, a little boy who lives on a cliff near the sea. His mother works at a nearby retirement home and his father is a sailor away at sea. One day while he’s playing near the ocean, he spots a goldfish with her head stuck in a mason jar. So he frees the fish from the jar, puts her in a green bucket full of water, and keeps her as a pet. He names her Ponyo. But Ponyo is not just any old goldfish. She’s the magical daughter of a sea wizard and a goddess. She ends up falling in love with the boy who rescues her, and when her father takes her back home deep in the ocean, she’s devastated and longs to return back to Sosuke. So she defies her father by using her magic to turn into a human to live on land with the boy. It works, and the two kids are now able to play with each other side by side on shore. But this act of magic disrupts the balance of the Earth, thus forcing the city by the ocean to be flooded over. It’s now up to everyone to restore balance to the Earth while still fulfilling Ponyo’s wish to be a human girl. 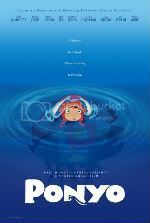 The movie absolutely starts off strong with Ponyo’s initial venture into shallow waters. Miyazaki, as he does in most of this films, emphasizes the damage that humans are causing by polluting the ocean waters. 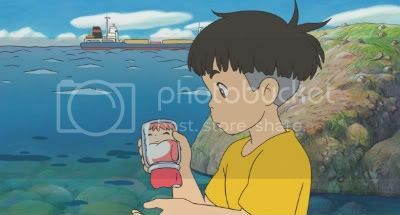 After all, Ponyo does get stuck in a mason jar within the film’s opening sequences and nearly dies. And as Ponyo’s father goes into shallow waters to rescue his daughter, he is surrounded by filth and becomes disgusted at the way humans treat nature. A very clever commentary that should strike a nerve with many adults, especially now with the recent “green” movement. 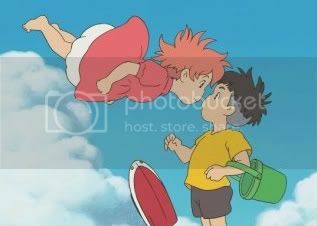 The movie also strike some beautiful imagery in the scene where Ponyo turns into a human and tries to reunite with Sosuke on land. Without her fins, she is unable to swim, so she runs across the surface of the water on the backs of what looks like a school of trout frolicking in the waves. In fact, Miyazaki employs this device a lot in the film to give the impression that the ocean is more of a living creature than just a simple body of water. But this is where the cleverness ends as the film fails to go anywhere beyond this point. After Ponyo turns into a human and is reunited with Sosuke, all the excitement is washed away with the rain water and the audience is left with about 30 more minutes of plot developments that make no logical sense. When the film alludes to the potential of something remotely exciting or climatic just around the corner, it quickly crushes that hope by showing that, in fact, everyone is just standing around doing nothing. This final act is as bland and dull as unflavored oatmeal. When you consider this ending with that of Howl’s Moving Castle, I’m left to wonder if Miyazaki is purposely holding back on his creative potential in order for his films to be more “accessible” to foreign audiences. At least that’s what Disney is aiming for by making this his largest US release so far in his career. And they’re sweetening the pot by casting a Jonas brother and Miley Cyrus’s little sister in the lead roles. They even remixed the film’s iconic (and very catchy) theme song to be more hip and cool with that Hannah Montana demographic. While this may be completely alienating to the mature American fans who’ve grown up with Miyazaki’s past work, it totally makes sense from Disney’s marketing perspective. However, Ponyo is still not going to appeal to that mainstream audience either because you still can’t hide the fact that it’s Japanese. The talent of big named Hollywood celebrities like Tina Fey and Liam Neeson are wasted because the actors focus more on syncing their lips with the dub than on delivering their lines. This ends up with plenty of awkward moments that will remind the audience that they are watching a foreign film. Then using the occasional Japanese phrase like “sensei” or “-san” will just further alienate that mainstream American audience. Ponyo completely misses its mark on whatever it was trying to aim for. This is not a good Miyazaki animated film. Hell, it’s not even as good as most American animated films. But really, it is supposed to be a film for children, right? Clearly a G-rated movie was not made with adults, anime otaku, or art house fans in mind. So how does it play out for its intended audience? The Good: Very creative depictions of water and sea life. Strong opening. Catchy theme song. The Bad: Final act is pure anticlimactic nonsense. Hollywood dub actors focus more on lip sync than delivery in performance. Final Verdict: Despite creative visual achievements and a good setup, Miyazaki’s Ponyo completely misfires and fails to entertain both kids and adults alike. This entry was posted on Wednesday, August 12th, 2009 at 2:03 pm by Scott	.